For white wines, it doesn’t get much drier than Muscadet. Grown near the mouth of the Loire River, Muscadet is at once brisk and hearty — the essence of the windswept Atlantic coast. It’s also affordable and abundant. Wine writer Lettie Teague calls it “one of the world’s best, if most obscure, bargains,” saying “a glass of $8 Muscadet will always be a better wine than an $8 glass of something else.” We’ve recently restocked one of our favorites: Cuvée Deux Roches from Martin-Luneau. 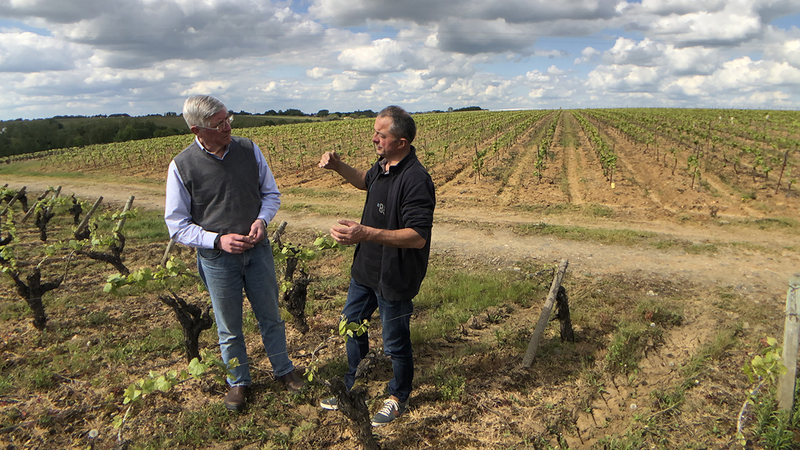 The Muscadet region’s new “cru communal” appellations require aging 24-30 months on lees, and Martin-Luneau’s excellent Gorges and Clisson cuvées both qualify. But today’s “Deux Roches” cuvée blends juice from both appellation — the name refers to the distinct subsoils of the two Cru terroirs. It bears the name of neither appellation, but the wine’s quality speaks for itself. Their current release is the 2012 Deux Roches Muscadet de Sèvre et Maine Sur Lie cuvée is bright and crisp, with lime rind and melon in the nose, and vibrant freshness in the mouth. Its time on lees gives it roundness and beautiful dry depth. Pair it with anything from the sea — most perfectly, oysters. Or fresh goat cheese on crackers or crusty bread. Skip the bland, nondescript white at your next dinner party — Muscadet is more interesting, more complex, and still a bargain.